Please refer to our stock # WD45 when inquiring. Chinese mythology has a rich, long history and is a collection of folktales, cultures and religions that have been passed down in oral and written traditions over the centuries. In Chinese mythology it is often quite difficult to separate history from myth, and mortals from immortals. CONDITION: Some creasing throughout; the colors and images are still bright, and the painting has been remounted on white paper-backed silk. DIMENSIONS: Image is 33 ¼” high (76.8 cm) X 17” wide (43 cm). 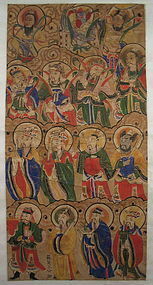 Entire scroll: 68” high (1.73 m) X 21 ½” wide (52 cm).